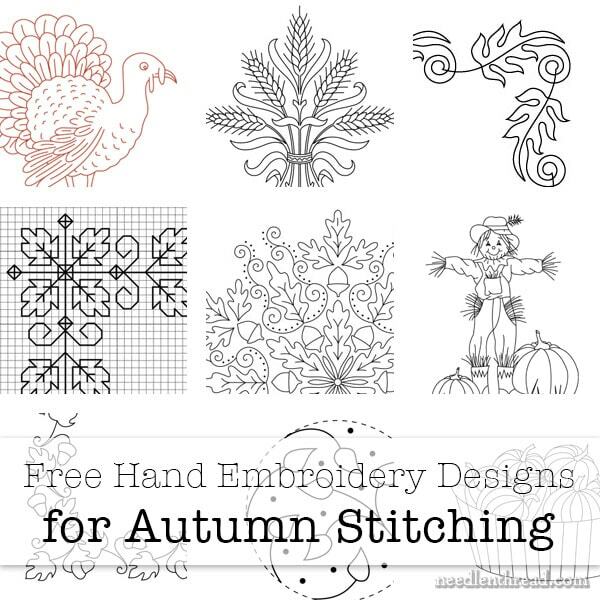 If you’re still in Autumn Mode when it comes to stitching, but you’re floundering about for some embroidery design ideas, I’ve put together a small collection of free fall-themed hand embroidery patterns to help you out! In fact, did you know you can search Needle ‘n Thread by topic, by visiting this list of organizational tags? It’s a fun way to navigate the website. After 12+ years of blogging, there’s a lot of useful stitching information on Needle ‘n Thread – it’s fun to dig up old gems by foraging through the topic list! But I digress – back to the fall pattern round up! All of these hand embroidery designs are free for personal use. They can be dressed up or down. You can stitch them up with simple line stitches (perhaps in an autumnal variegated floss, to keep it really simple? ), or you can go all out with fillings and color and all kinds of stitch selections. Some of the designs are decidedly more juvenile (like the scarecrow, which I doodled up for my niece to print and color, and the turkey, which looks a bit startled). Some are a bit more stylized and formal (like the wheat tile). There are a few corner designs (the blackwork leaves, leafy corner, and acorn and leaf border), which would make nice accents for cloth napkins on the Thanksgiving table, or as a stitched corner on a flour sack towel (a great hostess gift for autumn dinners). Leafy Corner – perfect for a quick stitching project with just a touch of fall. It’s also well-suited for tambour embroidery. Turkey – a bit juvenile, but fun! Blackwork autumn leaves – meant to be worked on a grid, if you want to work it on plain weave, you’ll find ideas on how to do that here. Wheat Tile – formal, attractive bunch of wheat, it would look great as a corner motif. Scarecrow and Pumpkins – Juvenile, true, but lots of possibilities to dress him up! Pumpkin Basket – this comes with a pattern and a stitch guide with instructions. Fall Acorn Border – another quicker study, depending on how you stitch it. If you want to go all out, you could fill the leaves and the acorns! Smalls for Autumn – they would make interesting jewelry inserts (which is what the article is about), but they’d also work up into fall-themed scissor fobs, mini ornaments, and whatnot. If you own Lavender Honey & Other Little Things, you could use the finishing instructions in there to make ornaments, fobs, and little needle books with these designs. Autumn Leaves & Acorns – an fall kaleidoscope pattern. I’ve already seen a gorgeous interpretation of this, stitched up, in the Needle ‘n Thread Community on Facebook. It’s a fun design and works up beautifully. It’s almost time to start thinking more about winter stitching, isn’t it? I’m the type that tends to theme-stitch during the season, rather than ahead of it. If you like to stitch ahead of the season, you’ll find several Christmas and winter-themed embroidery patterns on Needle ‘n Thread, too. And don’t forget Twelve Trees for Christmas! They’re fun, quick studies in small Christmas trees, great for relaxing embroidery projects for the upcoming season. Thanks, Mary! This is a really early Christmas present! Always reading with much interest – but not so much stitching anymore. Thank you very much. The free patterns are really great as there is something for everyone and as you say they are fun and quick projects to take you through those long winter evenings. Thanks for sharing this collection of free patterns with us and for the links on how to embroider them. I hope you have a great weekend.